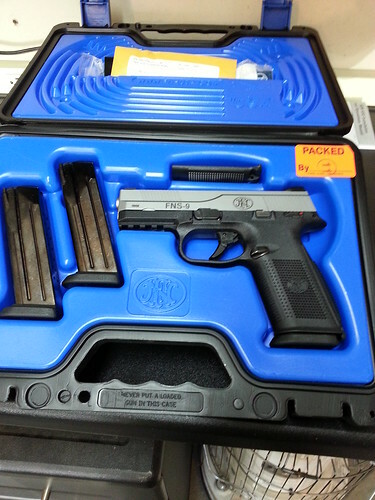 Was looking around today and had thought I was going to get a M&P or a SR. Already have an XD. Held this FNS and it just felt right in my hands. Now gotta get a holster and a couple more mags, any ideas who has some mags, ya I know....haha. Opinions are like assholes, everyone has one, and everybody thinks everyone else's stinks. "Be wary of the man with only one rifle, he'll surely know how to use it"
Drug free, so put the crack up. Very nice pistol. FNH is on my short list. Sig was in the running also but being a lefty and operating the controls was just ackward for me, the FN fits me like a glove. I had the FNX9 and FNX40. The biggest mistake was getting rid of them. I bought them when they first came out and finding holsters was a pain. Also every carry gun I have has night sight and you could never find any night sights anywhere. Had set on order for 4 month's never came in. Now holsters and sights are easier to come by and on my list to replace is the FNX. You will be very happy with your FNS, good luck and enjoy. The FNS came with nite-sights and the 3 17rd mags you see in the pic. Pretty good start I think, holster would of been nice to start out with but in my experience factory holsters(springfield as an example) leave a lot to be desired. And I always upgrade anyway. I have no idea why they went to a dinky little safety lever on the FNS. I was ready to get one until I saw that. Hopefully there's a way to remove it entirely. is the 5" model out for sale yet to the general public? they showed it at Shot. So I would guess it will show late next year. 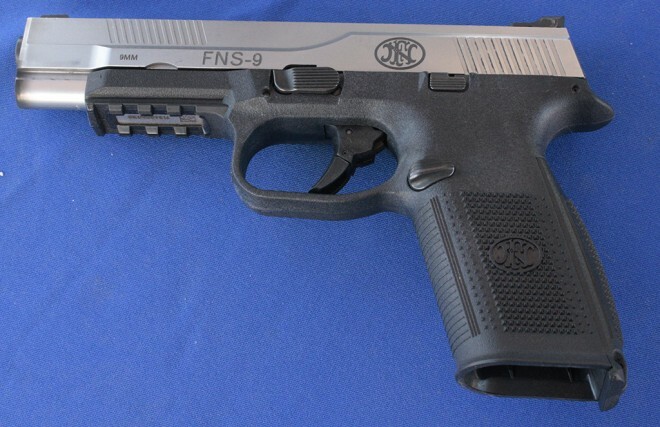 The FNS 9 is sweet. Enjoy it. I sure did! I ride the safety on guns like that, and if the safety is too small to ride, I just want it out of the way entirely. The 5" gun looks like it's more my style... I have enough compact 9mms.